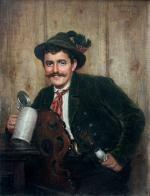 Portrait of a happy young beer drinker in the German folk dress was executed in 1899 by Ernst Schmitz ( 1859 in Dusseldorf - 1917 in Munich), popular German genre and portrait painter, who recieved acknowledge for his genre folk portraits. He studied at the Royal Prussian Academy of Arts in Düsseldorf, then he became a student of Friedrich von Keller in Stuttgart. 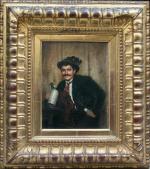 The artist worked in Karlsruhe, Freiburg im Breisgau, Stuttgart and from 1884 in Munich. Literature: all in German: F.von Boetticher „ List of paintings of 19th century “; Bruckmann´s Encyclopedia of Munich Art. 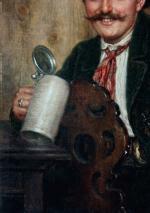 Munich painter in the 19th century. Bruckmann, Munich 1981; Lexiocons by Thieme/Becker, Leipzig, 1907-1950 and Buse , 1977; in French: Benezit, Paris, 1999. 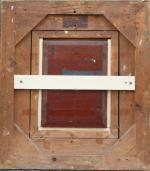 Measurements: unframed w 6 1/4" x h 8 1/4" (15,7 x 21 cm ), framed w 14 1/4" x h 16 1/8" ( 36,4 x 41 cm ).